Micro-volume quantification is fast and easy with the Take3™ Micro-Volume Plate, used in your BioTek microplate reader. Measure multiple 2 µL samples at a time, without diluting and without needing specialized equipment. Pre-programmed nucleic acid and protein protocols in Gen5 make quantification fast and easy. It takes only 2 µL of undiluted sample to get rapid results with the Take3 plate. Choose from the 16-sample Take3 or the 48-sample Take3 Trio for higher throughput. Take3 plates are compatible with most of BioTek’s multi-mode readers, imaging multi-mode readers and microplate spectrophotometers. Gen5’s pre-programmed dsDNA, ssDNA, RNA and protein (BSA, IgG, lysozyme) measurement protocols make getting direct quantitative results quick and easy. Add sample IDs and define blanks if desired. Endpoint results and selectable spectral scans provide quick visual results and are output in convenient .xls, or .xml formats. The Take3 plates aren’t limited to absorbance detection – they are useful for micro-volume fluorescence quantitation as well – with only 2 µL sample volumes. Compatible with many of BioTek’s multi-mode readers and imaging multi-mode readers. Residue and dust can wreak havoc on micro-volume measurements, so it’s important to keep the sample surfaces super clean. Take3 plates are so easy to clean – simply wipe samples off after measurement with a laboratory wipe. 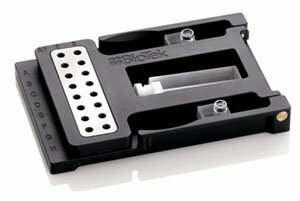 Along with 16 microspots, the Take3 plate can accept a standard 1 cm cuvette or 2 patented BioCells for rapid 1 cm measurements in a BioTek microplate spectrophotometer. The Take3 Trio offers 48 microspots and 2 BioCell positions.